The main characters in my new drawings are women – wild suns, vanguard, wise, who value freedom and build their own world. You can read the exhibition as a book, follow the narration page by page or open it anywhere. It is a story of community and heritage, oppression, an attempt of annihilation, struggle and reconstruction. 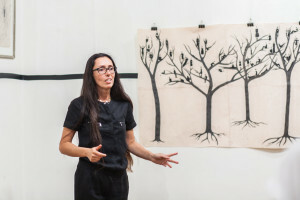 The artist does not need to be introduced to anyone – she has been active on the Polish art market for nearly twenty years, and the main theme of her artistic research is a human, his or her role, identity, emotions and body. She is interested in gender and feminism. Graduate of the Academy of Fine Arts in Kraków (graduation from the Faculty of Graphic Arts with Professor Stanisław Wejman in 1998; doctor of fine arts with Professor Jacek Gaj in 2007). 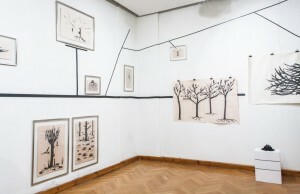 Her works can be found in the collections of the National Museum in Krakow, Uppsala Art Museum in Sweden, Polish Museum of America in Chicago, Museum of Paper in Mino, Prefectural Gallery Kanagawa in Japan, Museo civico di Crema e del Cremasco’s Graphic Arts and Drawings Studio in Italy and many private collections. 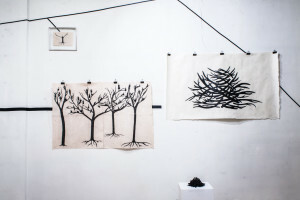 Her body of work encompasses several dozen individual and group exhibitions in Poland and abroad, she has won numerous prestigious scholarships and awards (Artistic Residence in Mino Art Village Project in Japan in 2002 and 2006, Cracow Graphic Art of the Month 2001, 2002, 2004, Grand Prix of the International Baltic Graphic Arts Biennale, Kaliningrad – Königsberg in Russia 2005, Artistic Scholarship of the City of Krakow 1999, Scholarship of the Minister of Culture and National Heritage 1997). We would like to invite you to the opening and the meeting with Małgorzata on Friday, 30 September at 7 pm.